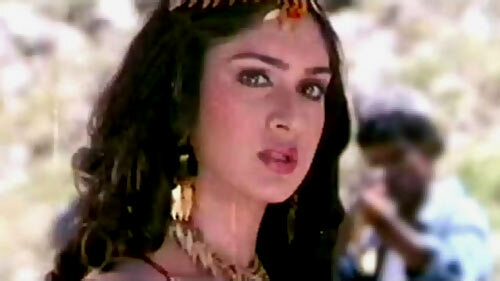 Rediff.com » Movies » Bollywood's HOTTEST superhero girlfriend? VOTE! Bollywood's HOTTEST superhero girlfriend? VOTE! What good are super powers without a chick to impress? Before Krrish 3 releases, we ask you to check out the various women who’ve enchanted our Bollywood superheroes and pick the best of the bunch at the end of this slideshow. Priyanka’s Priya Mehra showed up grinning moronically in the first Krrish, and might well be back but darker this time if the Kangna-in-Priyanka’s-clothing rumour turns out to be true. Either way, Chopra’s come a long way since the 2006 original (let’s just ignore Zanjeer happened, okay?) and might well turn up something interesting. We’re told Priyanka Chopra is Hrithik’s heroine in Krrish 3, but it’s Ranaut -- in her formfitting bodysuit -- who has gotten our attention. Her character, Kaya, is apparently a shapeshifting mutant who, if rumours are to be believed, turns into Priyanka Chopra to get closer to Roshan. Methinks the original shape might have served her better, yeah? Chopra was the best thing in Goldie Behl’s disastrous dud. Her character Sonia was a bodyguard to Abhishek Bachchan, and she was quite impressive in badass mode. The film might have been one of the biggest flops in Bollywood history, but Chopra acquitted herself quite well, for the most part. Plus, her look was genuinely cool. Hitting theatres more or less the same time as Krrish came another superhero movie called Alag which, true to its title, seemed to have a genuinely offbeat origin story -- which seemed impressive till we realised all the good bits were ripped off from an American film called Powder. At least Mirza looked luminous. Reema Kagti’s ensemble film might not be a superhero movie per se, but Lamba and Abhay Deol played -- in Mr And Mrs Smith fashion -- a pair of altruistic superheroes married to one another and yet unaware of their abilities. It was an interesting attempt, and while her costume looked a bit too Everready battery, Lamba had more fun with the part than she usually seems to. Personally, I think it isn’t even a contest. Sridevi got everything right in Shekhar Kapur’s 1987 masterpiece: from wearing a Charlie Chaplin moustache to screaming her lungs out, she rocked the role of the feisty journalist Seema Sahni. And for good measure, she set temperatures soaring as she looked her most ravishing in the unforgettable Kaate nahi katate song. Amitabh Bachchan’s inexplicably wheezy alter ego couldn't have felled many lasses, but Meenakshi Seshadri’s Shalu had quite the hots for the grey-haired nighttime vigilante. A smalltime con-artist, Shalu lives in a basti and hoodwinks with honour, and looks condescendingly upon Bachchan’s day-job shenanigans as a corrupt cop. Back in the 1980s and early 90s, Seshadri was the go-to Hindi film heroine when roles called for pluck, and while Toofan also starred the testosterone-y Amrita Singh, Seshadri was the right foil for Bachchan’s second superhero outing. Heavy with plot, the underrated entertainer has its many merits, and Seshadri’s extraordinary ability to handle cringe-worthy melodrama without actually making us cringe, came in rather handy. 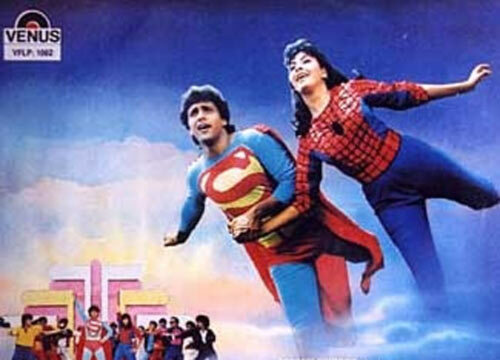 Right, Katkar didn't play a superhero in this 1988 melodrama, and neither did Govinda. But something has to be said for the fact that one song from it -- with the two dancing and flying around, and Katkar dressed as Spiderwoman -- remains viral while none of us (fortunately) remember anything else from the film itself. Bollywood's HOTTEST superhero girlfriends? VOTE! Kate Winslet, Angelina Jolie, Beyonce: Pregnant and VERY GLAMOROUS! Birthday Special: Malaika Arora Khan turns 40!